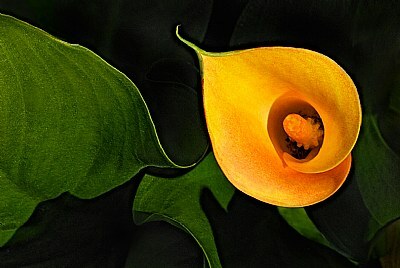 About The little calla (zantedeschia) is always helpfull and in elegant poses. Ciao Giuseppe! Very well drawn ... fantastic shapes, colours and textures ~ beautiful work! So exqusite and fine! The tones are lovely- a balletdancer among florals. FANTASTIC!!! I love that shape.... the flower looks like with a ....space wormhol! GREAT shape, beautiful also vivid orange that pop up nicely into the darkness! Rich colours and a beautiful composition - great floral Giuseppe! Pretty presentation, miraculous colours. Elegant photo. un bgran bel gioco di forte e forti contrasti! invece ti voglio fare ancora una volta i complimenti per la composizione: voglio dire, probabilmente chiunque altro si sarebbe fatto incantare dal colore e dalla forma del fiore, chiudendolo in un primo piano; tu, invece, lo hai valorizzato con le linee e i colori delle foglie. ed hai fatto proprio bene! This is a beautiful image, the colors, exposure and composition are perfect. All natural Martina. The colours are exactly what God chose and the grain on the leaves is only durst. a lovely painting dear Giuseppe!!! amazing colors!!!! fine presentation!!!! love it!!!! Very good composition, beautiful flower, colour and photo :) Good work. Terrific placement of the main subject. As usual great color and capture. Very beautiful floral.. lovely colors..